Americas gateway to the universe. Leading the world in preparing and launching missions to Earth and beyond. Oct. 4, 2002John F. Kennedy Space Center Spaceport Newshttp://www-pao.ksc.nasa.gov/kscpao/snews/snewstoc.htmVol. 41, No. 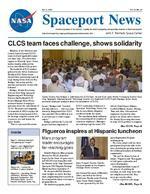 20(See MARS, Page 6) Inside Pages 4-5  Contractors contribute to space program. Page 2  Biannual Awards in Recognizing Our People.(See CLCS, Page 6) Members of the Checkout and Launch Control System (CLCS) team stood and applauded numerous times Sept. 20 to show their support as Kennedy Space Center leaders frankly addressed the recent cancellation of the project. The hundreds of KSC workers gathered in the Debus Conference Facility at KSC Visitor Center showed their unwavering esprit de corps during Center Director Roy Bridges discussion and the question and answer session that followed. Bridges, Shuttle Processing Director Dave King, Spaceport Engineering and Technology Director Jim Heald and CLCS Project Manager Bruce Hevey answered dozens of employee questions about the cancellation of CLCS. The project was originally set in motion in 1996 to replace the Launch Processing System (LPS), the heritage computer system used to process, test and launch the Space Shuttle. This is a personal discussion for me, Bridges said. I needed this time with you. SPACEPORT NEWS Oct. 4, 2002 Page 2 Recognizing Our PeopleExceptional Bravery Medal This Agency award is granted to an individual who, independent of personal danger, has acted in an exemplary and courageous manner to prevent the loss of human life or Government property or for the courageous handling of an emergency. The winner: Marc Latorre of United Space Alliance (USA). In recognition of a courageous act of heroism by saving the life of a stranger without regard to your own personal safety. Center Directors Gold Dollar Membership Card These cards are given to those individuals or teams who have received the Center Directors Gold Dollar for their commitment to safety, teamwork, innovation and willingness to go above and beyond normal job requirements to ensure mission success and customer satisfaction. Winners: William Lockwood and Keith Plauche of Space Gateway Support (SGS). In recognition of your quick response in alerting and providing support to a Canadian Air Force C-130 crew whose plane engine had caught fire. Winners: Joseph Queen and Robert Green of SGS. In recognition of your quick efforts to notify the STA Crew of an engine problem which allowed them to declare an emergency landing and land safely. Winners: Davy Chambers, David Trenn, David Moore, Vern Walker, Charles Parrish, Steve Jurlina, Philip Dickey, Dave Sheriff, Robin Floyd, Kurt Van Dyke, Mike McClure and John Seaman of USA. In honor of your problemsolving efforts that resulted in cutting roll-in time by 1.5 hrs, reducing man-hours, vehicle fuel cell usage, wear and tear on the orbiter and the tug. This improvement will produce an estimated annual cost avoidance of $45,000. Winners: Roger MacLeod, Amber Hufft, Jeff Lamke, Dougla s Hendriksen, Dudley Cannon and Bernie Roan of NASA. In recognition of sustaining KSCs position that the act of one of KSCs employees in negotiating with a proposer on an SEB procurement for a key person, post-employment position violated the procurement integrity act. Winners: Tracy Lee Crittenden of NASA and Brian Smith Department of Justice. In recognition of your work which led to the dismissal of two Federal Claims cases that could have resulted in costs of 4.1 million. Winner: Art Beller of NASA. For KSCs completion of the IT Security Awareness Training ahead of schedule and exceeding goals set by the Agency. Winner: David Robertson of NASA. For identifying Flight Hardware non-conforming conditions. Winner: Hung Nguyen of NASA. In recognition of your diligent inspection of the electrical monoball that resulted in finding two discrepencies that had not been previously detected. Winners: David Strait, Michael Decarlo and Tony Nesotas of USA. In recognition of your attention to detail that resulted in finding a potential catastrophic problem, Winners: Jerry Goudy of USA and Jack Weeks of Boeing NASA Systems at MSFC. In recognition of your teamwork and skill in making the repairs to the LH2 flow liners. Environmental & Energy Awareness Awards This award recognizes an individual, team, and/or small or large organization that has contributed to the successful operation of preserving our environment, conserving our energy, and reserving our natural resources while reaching for the stars. The recipients of this award have demonstrated an exceptional performance in making a unique contribution to the Environmental & Energy Awareness Program and for enhancing substantial savings. Winner: Ronald Funk of InDyne. In recognition of innovation and dedication to development and implementation of the environmental Electronic Data Monitoring Report Program. Near Term and Low Cost Energy Conservation Measures Team winners: Michael Milbert, James OMalley, John Weeks, Rachel Kamenetzky and Herbierto Soto Coro of NASA; Fulin Gui, Doug Thom, Richard Banta, David Baska,Michael Walter, Jeff Norgren, James Nelson, Terry Traylor, Bart Faulken-berry, Cindy Hastings, Joseph ODell, Michael Cressy, Gregory Coles, Chip Everhart, Chet Simmons, Glenn Richter, William Schneider and Dennis Hepburn of Boeing NASA Systems; and Brian Johnson and Brad Smith of USA. In recognition of highly successful near term and low cost energy conservation measures at the KSC Industrial Area International Space Station and Payload Processing Facilities. Replacement of Chromium Containing (Alodine) Metal Treatment Solution Team winners: Hugh Atnip, Dan Bernal, Phil Carr Mike Cassidy, Cathy Clayton, Ron Collie, Glenn Graco, Gene Harm, Mike Hobson, Ron Hoover, Terry Jordan, William Lewis, Victor Martinez, Roben Meyers, Allan Newton, Gina Parrish, Anil Patel, Rod Richardson, Tony Santos, Brian White, Harvey Wilcox, Randy Raley, Lee Zook, Martin Hicks, David Gilbert, John Bailey, Adam Stanley, Sonny Lahee and Dave McCue For identifying, qualifying, and implementing an environmentally friendly substitute material. This replacement material eliminated the largest waste stream at KSC, annually avoiding more than 40,000 Kg of waste and more than $30,000 in disposal costs. Outstanding Secretarial/ Management Support Assistant Awards This award recognizes individuals within the secretarial/clerical field who have demonstrated exemplary performance of official duties, who possess high personal integrity, judgment, and responsibility as well as having established and maintained rapport with those around them. Winners: Maxine Cherry of Safety, Health and Independent Assessment. In recognition of outstanding professionalism and teamwork in supporting the Process Tools & Techniques Division, as well as the Safety, Health & Independent Assessment Directorate. Jan Mayers of Spaceport Services Directorate. For providing critical secretarial support, ensuring timely, accurate, and responsive service to all customers, and providing a key role in the success of the Safety, Occupational Health, and Environmental Division You Make A Difference Awards This award recognizes employees who have set examples of high energy and who are team players. These individuals reach out beyond their immediate organization for the good of KSC and the community. Winner: Betty Kelgey of Executive Staff Office. In recognition of the superior service that you provide to the Centers Executive Management Staff. Winner: Julia Hallum of the Workforce and Diversity Management Office. In recognition of the superior service and innovative solutions provided. Winner: Diane Bent of the Shuttle Processing Directorate. In recognition of energetic, creative and professional support of the NASA Shuttle Processing Safety and Mission Assurance Division. Winner: Florence Patten of Safety, Health and Independent Assessment. In recognition of your exemplary performance, tireless efforts, and customer focused contributions to the Centers Safety and Mission Assurance community. Winner: Christopher Comstock of ISS/Payload Processing Directorate. In recognition of leadership, dedication and enthusiasm in ensuring the continual improvement of the International Space Station/Payload Processing Directorate and KSC. Page 4 SPACEPORT NEWS Oct. 4, 2002 Contractors contribute to space pr o Remember i Contractor employees working side by side with NASA civil servants have played a major part in Kennedy Space Centers history of achieving Center and Agency goals for more than four decades. From a low of 30 percent of the workforce in the early 1960s to 80 percent less than a decade later, contractors helped prove that a great team can accomplish anything. We got the chance to work with a bunch of good people, contractors and civil servants (no matter what the percentages), recalled T.J. OMalley, a former chief test conductor with General Dynamics. Although contract tasks range from flight hardware processing to support services, every assignment serves an important function for the Center. During the early to mid-1960s, contractors such as Martin Marietta, General Dynamics/Convair and McDonnell Douglas contributed to the success of the Mercury and Gemini programs. In fiscal year 1964, the number of contractor employees was 4,743, compared to only 1,510 civil servants. At the height of the Apollo program, the Agencys workforce peaked. In fiscal year 1968, as the first lunar landing approached, 20,934 of the Centers 25,767 employees were contractors. Boeing, North American Aviation, Douglas Aircraft, Grumman Aerospace, IBM and General Electric made up the bulk of the contractor workforce at KSC. I was a Chrysler employee loaned out to Grumman to help with the Lunar Lander. We all got to sign a photograph that was left on the Moon. How many jobs give you an opportunity like that, said Bob Murray, a recently retired United Space Alliance Color Television technician, who served a total of 36 years during two stints at KSC. Throughout the 1960s and 1970s, many contracts were evaluated on an annual basis, which sometimes led to a feeling of uncertainty. Contracts in more recent years are typically much longer, and often include options for extensions. On the Delta program, our contract was renewed every year, said Judy Swenson, who worked for 35 years as an administrative assistant for McDonnell Douglas, Martin and Lockheed. We never knew if wed survive the layoffs or not. But when I was working in Payloads, we had a 15-year contract. There was a much better sense of security. Other employees recall a time when the workforce was smaller, and people worked more closely together. Wilbert Robby Robinson spent 28 years at the Cape as an engineer with Chrysler, Bendix, the Boeing Company and McDonnell Douglas. Individuals came up with ideas to make something safer or faster, and management would listen, he recalled. Marylyn Liacopolous, a former industrial nurse with Pan Am and EG&G, also remembers. When I was with Pan Am, we were much more of a family. It was before the paramedics took on some of the work. We answered a lot of calls together and were very close-knit. Over the years, NASAs workforce has decreased, resulting in an increased workload for contractors, which today include employees of United Space Alliance, Boeing, Space Gateway Support, Lockheed Martin, Dynacs and Dynamac and many other companies. The government has taken on a more supervisory role, trusting contractors to do their tasks. NASA can do the forward-thinking, cutting-edge planning, and count on contractors to meet the new goals, said Roy Tharpe, chief of staff for Bruce Melnick, vice president of Boeing Space Coast Operations. In the old days, the relationship between civil service and contractor was very confrontational. But now, there is mutual trust, respect and understanding. This sentiment was echoed by Barbara LeDuke of Dynacs, who has worked at KSC for more than 38 years for a variety of contractors. As NASA has changed, its needs have changed, and it relies on its contractors to adjust their services accordingly. There are many benefits to the presence of a large contractor workforce. Bill Bailey spent 42 years as an inspector and believes the variety of contractors produces a wide range of backgrounds and talents. They bring inputs and ideas from all over the country. Tharpe pointed out that continuity is an added benefit. With the high number of contractor employees, you see a continuum of processes. Hands-on work requires a highly skilled and highly motivated workforce, and contractors are often the ones turning the wrenches. Perhaps best of all, it opens the space program to nongovernment individuals. It gives people outside the government the chance to find meaningful employment in the aerospace industry, said Al Cooper, who has spent 22 years at KSC as a security policeman. It gives regular people the chance to be a part of history. Contractors positive impact on the space program hasnt been lost on NASA. Almost 90 percent of NASAs budget goes to industry and academia, said James Hattaway, director of the KSC Procurement Office. The collaborative efforts of industry, academia and government have enabled the Cape Canaveral Spaceport to become the worlds leading space launch facility. NASAs future successes will depend upon continued teamwork and cooperation.Space Gateway Support securi t From left, T.J. OMalley, a form e Dynamics; astronaut John H Gl e spacecraft test conductor, sit be spacecraft. Oct. 4, 2002 SPACEPORT NEWS Page 6MARS ...(Continued from Page 1)CLCS ...(Continued from Page 1)the LPS. The CLCS team has been given 60 days to wrap up the project and find ways to make the best use of the technologies developed during the project, either within the Shuttle Program or through technology transfer. Bridges called the cancellation a failure of leadership, not a failure of technology. He claimed the ultimate responsibility for the cancellation and praised the team for their hard work and their successes, including the new CLCS system delivered to the Hypergolic Maintenance Facility for use in processing and testing. Our budget situation is different today than in 1996, when the program started. Today, NASA doesnt have the budget to spend what would have been necessary to complete and support a project not considered essential for safety and the continuation of the Shuttle Program. We can live with the LPS, which has served us well for all these years. A NASA Headquarters review team reported that the CLCS project would go over budget and that the full CLCS computer system would cost $15 million a year more to run than LPS. Many have said the project was under funded from the beginning. In todays budget environment, were going to have to have the courage to stop projects that exceed their budgets, Bridges said. The CLCS cancellation has been the subject of numerous media reports, including one made before management had time to inform workers of the project cancellation. One worker, responding to media criticism of how Hevey handled informing employees in response to a premature media report, stood and said, We want you to know that we know you did the best that you could in a difficult situation to inform us of what was happening, and we took no offense. The entire CLCS team jumped to their feet and clapped fervently to show their agreement. The media reported that CLCS team members were blindsided by the cancellation, but Bridges pointed out that the team had known the program was under review. We will try to do a better job in the future to keep you updated on the CLCS closeout process, Bridges said. Managers will be communicating with you frequently during the 60-day period to let you know how the project is wrapping up. The good news I can give you today is that no one will lose their job within these next 60 days. Business leaders who wish to better understand how to contract with the government will not want to miss the Business Opportunities Expo 2002 October 22. Government purchasing agents will also want to attend to learn what local and national vendors have to offer. The Expo will be held from 9 a.m. to 3 p.m. in Cruise Terminal No. 5 at Port Canaveral. To kick off the Expo, NASA/KSC and the 45th Space Wing will present a Contractor Awards Ceremony. The annual trade show  sponsored by the NASA/Kennedy Space Center Small Business Council, 45th Space Wing and Canaveral Port Authority  will feature 175 business and government exhibitors, some from Brevard and others from across the country. Exhibitors will include vendors from a variety of product and service areas, including computer technology, communication equipment/services, construction, and safety products. Representatives of NASA, the 45th Space Wing, prime contractors, Florida Space Authority, and many more will be available to give out information and answer specific questions about doing business with their respective organizations. Were encouraging everyone involved with government contracting to be a part of this extraordinary networking and information gathering opportunity. In the past 11 years, this event has gained a good reputation for providing businesses excellent opportunities, said Gloria Marsh, small business liaison with NASAs Central Industry Assistance Office. That office provides support to small businesses that want to do business at KSC. It works with the NASA/KSC Small Business Council to help small businesses learn how to navigate in the world of government contracting. By co-sponsoring the Expo, the Council helps provide a one-stop environment for buyers and sellers. Both sides benefit. Admission is free and open to the public. For more detailed information, go to the following website at http://expo2002.ksc.nasa.gov/. Business Expo planned for Oct. 22Mariachi Jalisco plays in the foyer of the Debus Conference Facility for the Cape Canaveral Spaceport Hispanic Heritage Month Luncheon. Kennedy Space Center managers meet with CLCS team members to discuss the cancellation of the CLCS program.than three to five years before I either asked or was asked to take a new job, Figueroa said. Sometimes it was painful to take on a new challenge, but I didnt let my fear stop me. In like fashion, humankind will continue to explore the universe even though some missions may fail. NASAs next Mars mission, set for March, is designed to gather rock samples to help scientists discover whether life exists or ever existed on Mars. Now that we know there are likely other habitable planets, the question Are we alone? is being asked more often and more loudly, he said. SPACEPORT NEWS Oct. 4, 2002 Page 7 Interested in protecting our national energy supply by using energy efficiently? Well, theres no better time to learn ways to do so than October, when the U.S. Government observes Energy Awareness Month. This years U.S. Department of Energy (DOE) awareness theme is A Secure Energy Future: Conserve Energy to Ensure Affordable, Reliable Power Supplies. Remember to follow Kennedy Space Centers awareness slogan and Get a Grip on the Power, Save Energy at KSC. Obtain KSC Energy Program information at http:// environmental.ksc.nasa.gov, which includes a link to DOEs Federal Energy Management Program Web site. According to Ray Coffman, a United Space Alliance facilities design engineer, some of our energy operations are similar to driving a car with an on/off switch instead of an accelerator pedal. Old compressors at the Assembly and Refurbishment Facility were designed this way. They would reach full speed when air pressure got low, run for a while, and then shut off. Whether its a car or an air compressor, operating like that wastes energy and is hard on the equipment, said Coffman. The inefficient air compressor set-up was recently remedied through a Florida Power and Light alternatively financed project. FPL provided a loan for upfront project costs and KSC ultimately repays the loan using energy bill savings generated by the project. An excellent example of producing significant energy savings within their existing operations/ maintenance budget was an Operations and Checkout Building High Bay project, which will be detailed in the the next issue of Spaceport News The Payloads/Station Team reduced heating, ventilation and air conditioning system energy costs for the High Bay to one-tenth previous levels while improving temperature and humidity conditions. In a similar proactive approach, the Energy Working Group is providing educational opportunities throughout October, so the entire workforce can become energy efficient as well. The KSC Energy Policy states that energy efficiency is everyones responsibility, explained Wayne Thalasinos, KSC Energy Manager. To meet our federal goals and reduce costs, we need everyones contributions, not just in October but year round. For example, tours are scheduled for KSCs largest mechanical equipment room and the Central Heat Plant. During these tours, employees, with supervisor approval, will learn about topics such as how KSC employees strive to efficiently maintain critical clean work area environmental conditions such as temperature, static pressure, relative humidity and cleanliness. To register, contact Barbara Naylor at 8678452. Also, the 45th Space Wing and Lockheed Martin will conduct chiller plant tours at Lockheeds new Vertical Integration Facility at the Atlas V Complex 41 on Cape Canaveral Air Force Station. Contact Melanie Clegg at 8530925 to register. There will be plenty of opportunities to learn by example also. Chosen by the Dept. of Energy for their long-term efforts to improve energy efficiency at the tracking and data relay station, KSC MILA won the Federal Energy and Water Management Award. Congratulations to Abraham Cicchetti, Roscoe Johnson, Howard Ashworth, David Swartz and Leto Leonen.October is Energy Awareness MonthSuper Safety & Health Day presentation set Oct. 23On Spaceport Super Safety & Health Day, October 23, Kennedy Space Center, Cape Canaveral Air Force Station, and Patrick Air Force Base employees will have the opportunity to see a presentation by nationally known speaker John Drebinger Jr. Drebinger, known as the master of safety communication, will serve as keynote speaker and kickoff the days events at the KSC Training Auditorium. For more than 15 years, Drebinger has been teaching people to take personal responsibility for their own safety and health while making safety and health interesting. A member of the world famous Hollywood Magic Castle, Drebinger captivates his audience by incorporating magic and humor into his presentation. He inspires and motivates people to take action and the steps necessary to work safely. In additon to being an excellent speaker, Drebinger is also a well-known author. His book  Mastering Safety Communication  is recognized by members of the safety industry as an outstanding training resource. Loaded with communication tools and techniques,  Mastering Safety Communication  has enhanced the safety training programs of a wide variety of major corporations and government agencies. One of Drebingers primary goals stated in his book is to enable managers, trainers and safety professionals to become effective communicators resulting in fewer workplace accidents. Drebinger believes that communication is the key to success and that the secret to success is to be committed to constantly learning. A life-long fan of the space program, Drebinger is no stranger to NASA and KSC. He has visited the Center several times and said he is looking forward to returning for Spaceport Super Safety & Health Day 2002. Drebinger is a member of the National Safety Council, the American Society of Safety Engineers, and the National Speakers Association. He holds a bachelor degree in speech and is a Certified Speaking Professional. Seating for Drebingers presentation is limited. Allocations will be made based on the workforce population of each organization/ company. The presentation will also be broadcast live on NASA Television. For more information on Spaceport Safety & Health Day activities and John Drebinger Jr., visit the Web site at http://www-ss.ksc.nasa.gov/ supersafety2002.MILAs Federal Energy and Water Management Award winners (pictured from left) are Abraham Cicchetti, Roscoe Doug Johnson, Howard Keith Ashworth, David Swartz and Leto Leonen. Page 8 SPACEPORT NEWS Oct. 4, 2002 John F. Kennedy Space Center Managing editor. . . . . . . . . . . . . . . . . . . Bruce Buckingham Editor. . . . . . . . . . . . . . . . . . . . . . . . . . Kathy Hagood Editorial support provided by InDyne Inc. Writers Group. NASA at KSC is located on the Internet at http://www.ksc.nasa.gov USGPO: 733-133/600018Spaceport News Spaceport News is an official publication of the Kennedy Space Center and is published on alternate Fridays by External Relations and Business Development in the interest of KSC civil service and contractor employees. Contributions are welcome and should be submitted two weeks before publication to the Media Services Branch, XAE-1. E-mail submissions can be sent to Katharine.Hagood-1@ksc.nasa.gov Delaware North Parks Services of Spaceport, Inc. (DNPSS), operator of Kennedy Space Center Visitor Complex for NASA, has announced that it will purchase the Astronaut Hall of Fame. In an agreement realized Sept. 27, DNPSS will lease the Astronaut Hall of Fame building and nearby maintenance facility on State Road 405 in Titusville, plus the surrounding land and contents of those buildings, from Southtrust Bank of Birmingham, Ala. The company will also purchase the intellectual property rights to the Astronaut Hall of Fame and make it an official part of Kennedy Space Center Visitor Complex. DNPSS will operate the Astronaut Hall of Fame in its present position for the foreseeable future, with a long-term plan to move the attraction to the Visitor Complex property. The Astronaut Hall of Fame is a significant part of Americas space program history, and were thrilled that it will remain open to the public, said Rick Abramson, president and chief operating officer of DNPSS. Millions of people will be able to continue to enjoy its artifacts, tributes and interactive exhibits, and to be inspired by the NASA story. The Astronaut Hall of Fame houses the worlds largest collection of astronaut memorabilia, as well as displays, exhibits and tributes dedicated to the heroes of Mercury, Gemini and Apollo. Realistic astronaut trainingDelaware North to purchase Astronaut Hall of Famesimulators allow guests to feel the pressure of four times the force of gravity, take a virtual walk on the moon, ride a rover across Mars, and land a Space Shuttle. While the Space Camp activity floor and equipment are located in the Astronaut Hall of Fame building, to be leased by DNPSS, the company did not purchase the intellectual property rights to the camp or purchase or lease its dormitory. DNPSS will instead use the activity floor and equipment for its current educational programs, which attracted more than 100,000 participants last year and include Camp KSC spring and summer day camps; educational field trips; job shadowing programs for students with disabilities; Overnight Adventure campouts; and Salute to Scouts days. For the near-term, well use the facility to enhance our existing educational programs, said Abramson. Were currently exploring the possibility of one day running a program similar to Space Camp, and were planning innovative, in-depth, educational programs that will take the Visitor Complex experience to a whole new level, he continued. As part of the Astronaut Hall of Fame acquisition, DNPSS will also enter into a formal partnership with the Astronaut Scholarship Foundation. Established in 1984 by the six surviving original Mercury Seven astronauts; Mrs. Betty Grissom, widow of the Virgil (Gus) Grissom; and other participants, the organization awards 17 scholarships annually to upper level college students and those pursuing advanced degrees in science and engineering. The partnership between DNPSS and the Astronaut Scholarship Foundation will provide for the retention of astronaut artifacts at the Hall of Fame; appearances by astronauts at special events; and the continuation of the annual Astronaut Hall of Fame induction ceremonies. Kennedy Space Center Visitor Complex is open from 9 a.m. until approximately dusk every day except Dec. 25 and certain launch days. Admission includes access to all exhibits, Astronaut Encounter, IMAX space films and the KSC Tour of restricted areas.. The Astronaut Hall of Fame houses the worlds largest collection of astronaut artifacts, along with training simulators and exhibits dedicated to the heroes of the Mercury, Gemini and Apollo programs. For information, visit www.KennedySpaceCenter.com or call (321) 449-4400.Cape Canaveral Spaceport Symposium set for Oct. 28-2940th Anniversary picnic Oct. 12Celebrate the 40th Anniversary of Kennedy Space Center with astronauts representing four decades of manned space flight. A special 40th Anniversary Picnic will be held Oct. 12 at 11 a.m. at Kennedy Space Center Visitor Complex. A limited number of tickets are available for the special event, which will feature astronauts Scott Carpenter, Gene Cernan, Brian Duffy, and more. Guests will enjoy a barbecue lunch and will have meet and greet opportunities with each of the Astronauts. Tickets are $24 for adults and $14 for children ages 3-11, plus tax. Tickets include the 40th Anniversary Picnic and a full days admission to Kennedy Space Center Visitor Complex, comprising all shows, exhibits, IMAX movies and the KSC Tour of restricted areas. Tickets may be purchased at www.KennedySpacecenter.com or by calling (321) 449-4400. Space program leaders will be taking a look at the Cape Canaveral Spaceport Roadmap to the Future during the 7th Annual Cape Canaveral Spaceport Symposium Oct. 29-30. The event will be held at the Radisson Resort at the Port in Cape Canaveral. The keynote speaker for the event is Dr. Jeremiah Creedon, NASA associate administrator for Aerospace. He will discuss the governments long-term vision for assured access to space for defense, commercial and scientific missions and explain why the Spaceport is important to the vision. Other speakers will examine the evolution of the spaceport and the master plan for its future, the importance of partnering for the development of the spaceport and emerging spaceport technologies. The symposium is sponsored by NASA/KSC, USAF 45th Space Wing, and Florida Space Authority. For more information and to register for the event, visit www.capecanaveralspaceport.org.